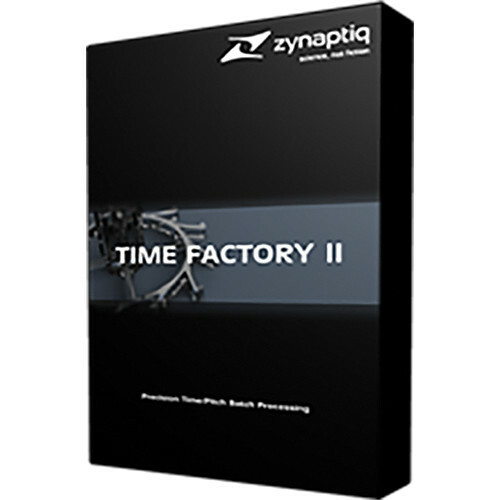 TIME FACTORY II from Zynaptiq is a standalone batch processing application for Mac OS X that does high quality audio time stretching and pitch shifting. It features industry standard MPEX, ZTX and ClearScale algorithms that allows for independently changing duration and pitch of any audio file over a very wide range of stretch ratios, all with fidelity and timing precision. The software supports phase-synced processing of mono, stereo and multi-channel files up to 384 kHz sample rate, and all popular audio file types including broadcast formats with meta-data preservation. Industrial-grade batch processing as well as formant shifting and correction are also available. Applications include frame rate (FPS) conversion for film sound, changing the tempo and/or pitch of music tracks for production or remixing a song, designing new sounds, or slowing down music for transcription.